I was kinda craving a Middle Eastern bowl like the ones they sell at Fresh Restaurants in Toronto. I really felt like eating falafels, and I was paying too much for store-bought and fast-food versions so I resorted to “home-made.” These taste like the real thing. Plus, they’re healthy, they’re filled with protein and healthy fats and they’re gluten-free. It’s a win-win all around. I’m the kind of person that just likes to dump everything into my food processor and let it spin, so that’s what I did. Don’t let it process too long though– the batter is supposed to be slightly lumpy. We don’t want a smooth, paste-like, spread-like consistency here. We like lumps and bumps. 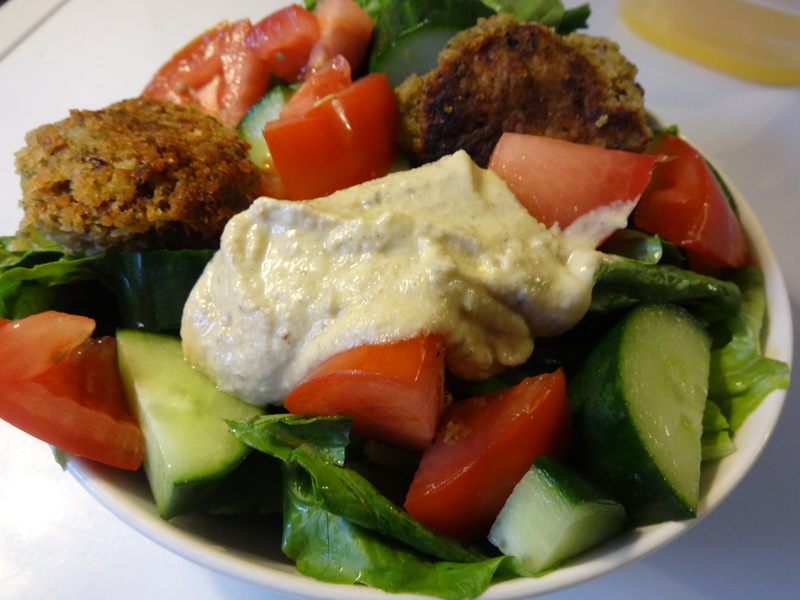 Form your falafel batter into small balls and put them in the fridge so they can firm up a little. I didn’t do this the first time around and so they fell apart while frying in my frying pan and soaked up a lot of oil, which is why I almost ended up eating a cup of coconut oil with my falafels. If you let them firm up and take shape, they will be much easier to fry. Fry them like you would fry fried dumplings (assuming that you know how to fry fried dumplings…): Put 3 tbsp of oil (coconut or avocado oil) and fry each side until browned. Add more oil if needed (but hopefully you won’t need much because you’ve allowed your falafels to take shape in the fridge beforehand right?). Let drain on a plate covered with paper towel. Serve hot on a bed of tomatoes, cucumbers and lettuce, or in a pita. Throw it all into a blender and blend. Add the water in a little as a time to achieve desired consistency. Once the mixture has reached a smooth consistency, pour it out and keep in a container. The hummus can stay refrigerated for up to a week. I wouldn’t hold onto it longer than that. For more hummus recipes, see here. Next Post Interview/Podcast with Sersie Blue from the Faithful Vegan Blog: Exploring Veganism Without All the Hang Ups!